If you're looking to score big with your friends on Super Bowl Sunday, ditch the traditional fare and go for something a little more outside the box. 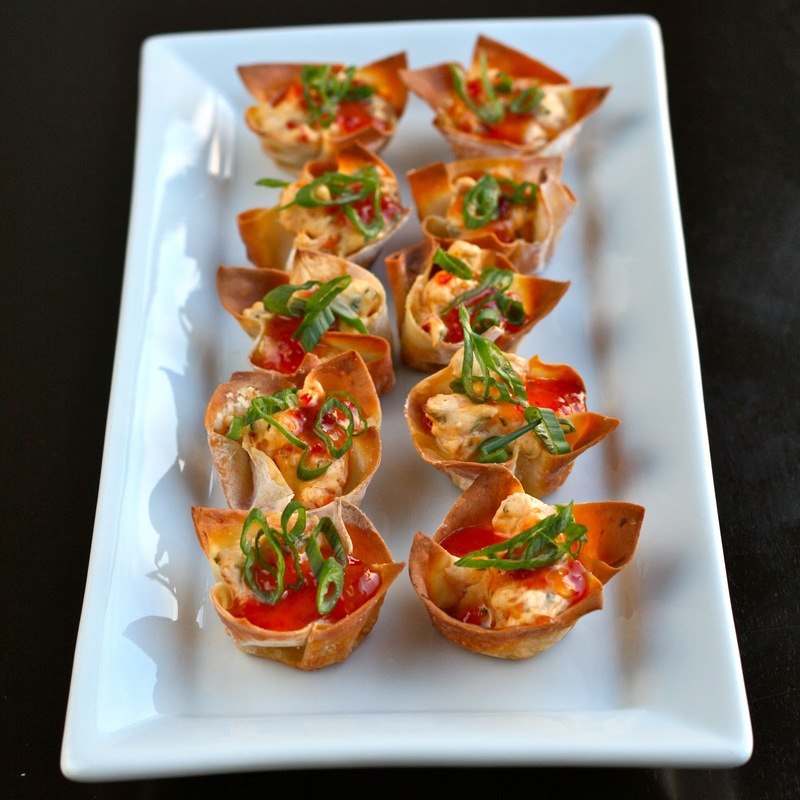 This is a healthier twist on crab rangoon. Normally it's fried in oil, wonton style. Here, I baked wonton wrappers in the oven to cut down on the fat and calories and used shrimp to make them a little more budget friendly. Add in a little low-fat cream cheese, some pepper jelly sauce, and you've got a winning appetizer. For more mini-sized Super Bowl recipes, check out my series of guest posts on HelloBrit.com. Super Sliders, muffin pan mania, and mini chips and dips! First, you'll need some cooked shrimp. I use frozen raw shrimp from Costco. Defrost them in a bowl of cold water. Pat dry, chop into bite sized pieces and season with kosher salt and chile powder. Remove from heat and toss with fresh lime juice and cilantro. Combine cream cheese, Worcestershire sauce and shrimp mixture in a medium bowl. Set aside. While cups are baking, make the sauce. Whisk together pepper jelly, mustard and vinegar. You can either serve as a dipping sauce, or spoon a little into each cup before garnishing. 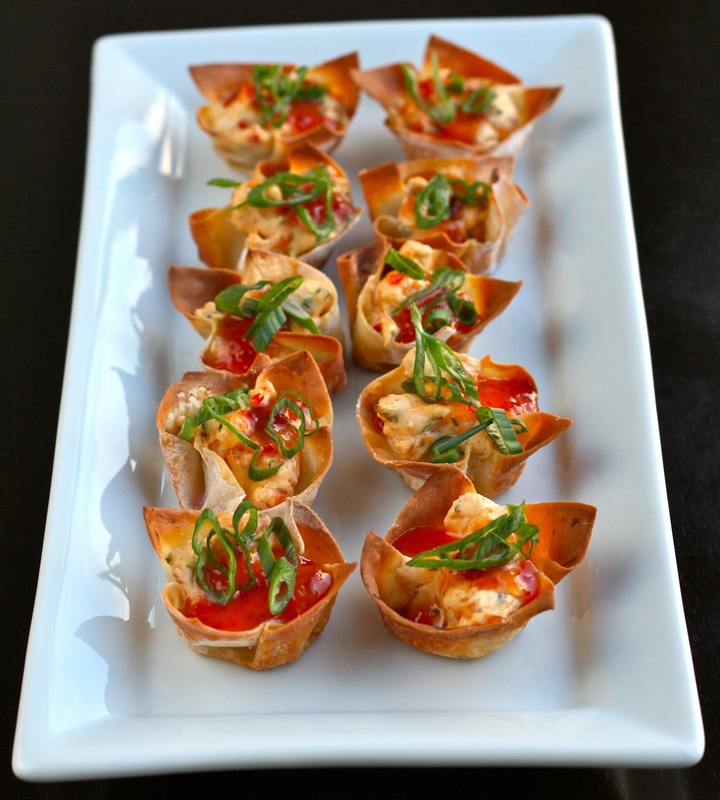 Remove from oven and spoon shrimp/cream cheese mixture into the cups. Return to the oven and bake another 7-8 minutes. (If you want the edges to brown up, lightly brush with a little olive oil). Spoon sauce on top and garnish each cup with sliced green onions. Serve warm or at room temperature.